music | What is your celebrity dream? This must have been inspired by the recent Billy Idol concert I went to ….where he rocked! 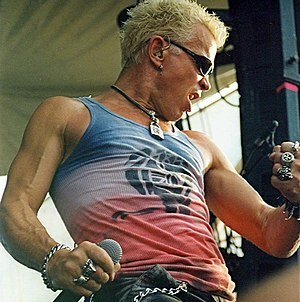 It was the afternoon and Billy Idol was warming up for his concert at the Tulalip Casino Amphitheatre. The theatre is outdoor and seats about 2,200 people, just the right size. The weather was sunny and warm. I was sitting in the back at a very long and skinny bar table watching Billy perform with a couple of my friends sitting across and behind me. He was prancing around the stage singing Rock the Cradle of Love and jumped down to walk through the empty seats hyping himself up for the upcoming concert. He wore black pants, with suspenders hanging down and an open long sleeve shirt leaving his muscular chest bare. His hair was his signature short and spikey and his eyes were heavy with black eye liner. When he finished up the song he walked over to our table. My friends and I were extremely excited as he approached and he immediately struck up a conversation with us. They only problem was it was all in French. None of us knew French and apparently that was all Billy knew too. After he realized we could not understand him he walked off leaving us to laugh at the oddity of the situation. What is your Billy Idol dream?